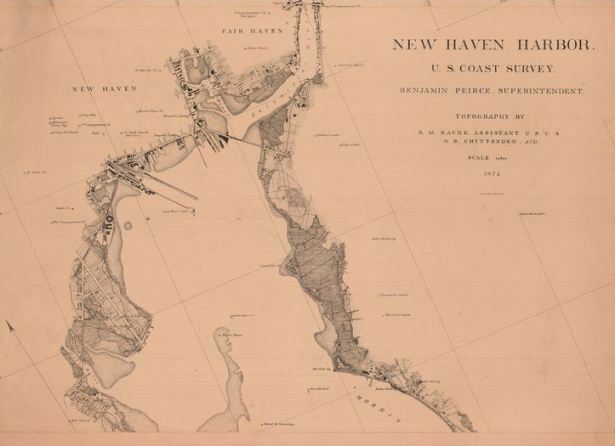 When the United States Coast Survey set out to compile detailed charts of New Haven Harbor in the 1870s, they hired recent graduates of Yale’s Sheffield Scientific School as assistants. George Benjamin Chittenden worked on a large 1872 chart of the harbor. Horace Andrews and James P. Bogart both worked on the even larger and more detailed 1877 chart. All three men were in their 20s when they worked for the Coast Survey. Both Andrews and Bogart were born in New Haven in 1852. Andrews went on to a successful career as the city engineer of Albany, New York, and Bogart would later work for the city of Bridgeport and the Connecticut Shellfish Commission on an extensive survey of the Connecticut coast. Ben Chittenden, who was born in Madison in 1849, served as a topographer on the Hayden Expedition (the 1871 US Geological Survey of the Yellowstone wilderness) and helped to map a large portion of the American West. A mountain in Yellowstone National Park is named after him. This chart is one of 800 maps and charts that are being digitized and made available to the public with support from Connecticut Humanities. “Maps and Charts: Finding Your Place in Connecticut History.” Connecticut Historical Society - eMuseum. Accessed August 26, 2013. Link.